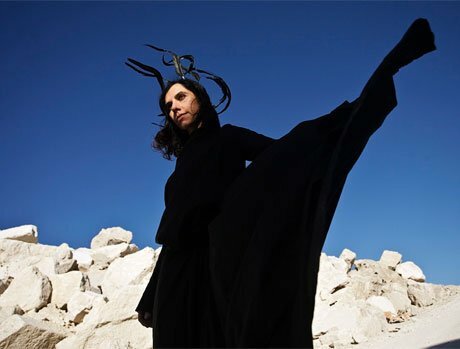 PJ Harvey releases her first album in three years today (February 15), and judging by the response so far, it's her best effort in a decade. Unlike her previous albums, the one-time Mercury Prize winner completely changed the rule book on her songwriting style. On Let England Shake, Harvey ditched the personal introspection she's built a career on for something completely extroverted: a loose, blood-spattered look at her country's history on the battleground. Needless to say, she needed to brush up on her history. "This album was something that I had to do a lot of research for through reading, the Internet and historical reference," Harvey told Exclaim! in a recent interview. "And also trying to find as much current, first-hand accounts as I could. I was just listening, listening to people, reading what's going on the news, looking behind the news as much as I could." Harvey, who admits that she began writing the album even before finishing 2007's White Chalk, says Let England Shake demanded a lot more of her attention than previous records. "It was a long, drawn-out process, two or three years of preparation," she says. "[But] I love learning. I have a huge appetite for learning, so anytime that I feel I'm learning it's very enjoyable for me. More so as I get older, history interests me even more, because I realize how very relevant it is to what's happening now. It becomes more important to me to gain this information because I can understand why things are like they are." Let England Shake is out now on Vagrant in North America and you can read our review here.